The restaurants of San Antonio, Texas, dish up holiday feasts ranging from traditional to trendy on Thanksgiving Day. Take the pressure of hosting a huge family meal off and turn on a fun new tradition of dining out with family, friends, or just your special someone. A variety of menus ranging from budget to gourmet, classic to vegan will be found across San Antonio. Remember: It's always a good idea to make reservations, ideally a week or more ahead, for Thanksgiving dinner. The Antlers Lodge in the Hyatt Regency's Hill County Resort and Spa traditionally serves an extensive Thanksgiving Day brunch menu with choices ranging from familiar breakfast items to soup and salad to roast turkey roulade, salt-crusted roasted red snapper, roast ham with citrus-vanilla glaze, sides of vegetable hash, garlic mashed potatoes, candied yams, five-bean casserole, roasted cauliflower and broccoli, cranberry sauce, and a special Thanksgiving dessert. With seating from 11 a.m. to 3 p.m., you can take advantage of the complimentary mimosas and champagne. On the iconic San Antonio Riverwalk, Biga on the Banks hosts a special all-day Thanksgiving brunch of New American cuisine, with seating from 11 a.m. to 7 p.m. In addition to both traditional and contemporary preparations of turkey, the restaurant's holiday specialties include prime rib, fried chicken, baked ham, and fish a la plancha. The feast culminates with a drool-inducing assortment of seasonal pies and festive treats.There are also special menu items for the kids. 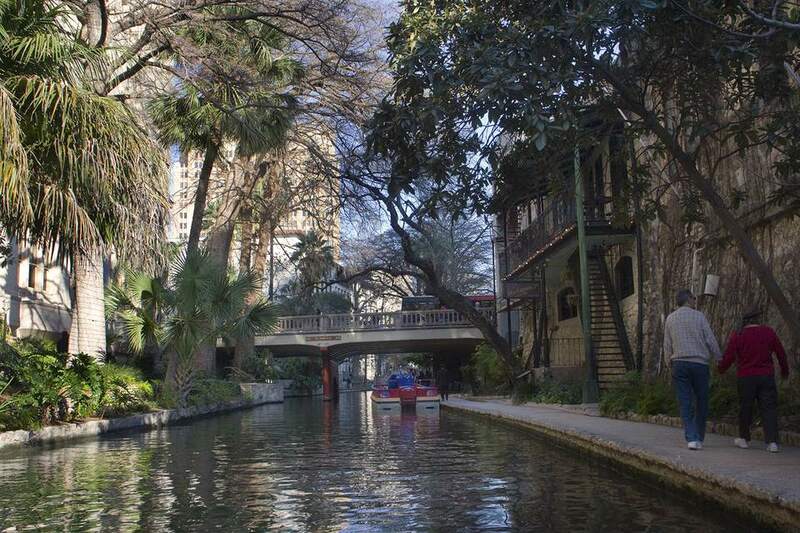 Boudro's in the heart of San Antonio's Riverwalk ​traditionally offers their regular dinner menu on Thanksgiving plus a fixed-price Thanksgiving meal from 11 a.m. to 11 p.m. Specials usually include such favorites as Niman Ranch pork chops with potato gratin or oven-roasted turkey breast with stuffing, haricot vert, and cranberries. In addition to the regular dessert menu, the restaurant offers a special holiday sweet potato pecan pie. All San Antonio-area locations of this budget chain eatery serve a Thanksgiving Day buffet, though hours and prices vary. Dine on holiday offerings including turkey, ham, and all the trimmings, plus sweet potato casserole and sweet corn pudding. Dessert includes traditional pumpkin and pecan pies. Green's Pearl Brewery location on Grayson Street traditionally serves an annual Thanksgiving feast with an all-vegan menu, including plant-based stand-ins for the traditional turkey, glazed ham, sausage-apple stuffing, and pumpkin pie courses. Seating is first-come, first served, from 11 a.m. to 4 p.m. and the fixed-price menu includes gratuity. The historic Colonial Room in the Menger Hotel, which was established in 1859, takes you back to Texas frontier days. The restaurant traditionally serves a Thanksgiving Day brunch buffet with seatings at 10:30 a.m. and 1:30 p.m. that includes turkey, lamb chops, pork loin roast, and seafood with the usual salads and sides. You may even get a complimentary glass of champagne with your meal. The Thanksgiving dinner buffet with a similar menu runs from 6 to 8:30 p.m. Many locals dine at one of Luby's 11 San Antonio locations on Thanksgiving. Guests choose from a selection of turkey or ham and trimmings served in the usual Luby's cafeteria style, available from 11 a.m. to 8 p.m. Reasonably priced plates include dressing, gravy, two sides, and a roll. You can even order a complete holiday dinner to take out. This Italian chain offers a special Thanksgiving menu that combines the pleasures of Turkey Day with Maggiano's Italian specialties in a four-course, family-style meal. Choose from traditional turkey and ham, and sides that include Italian-style focaccia-sausage stuffing and Tuscan creamed corn. The dessert menu may include such Italian favorites as tiramisu and chocolate zuccotto cake. You can also order Thanksgiving dinner to take home. SweetFire serves a more contemporary Thanksgiving buffet dinner from 11 a.m. to 8 p.m. that includes items from the raw bar, such as ahi tuna poke and oysters. A salad table offers a large selection of greens and other salad ingredients and a carving station serving up slow-roasted turkey, prime rib, and glazed ham. There's even an "action station" for made-to-order dishes like seafood paella, and a seemingly endless list of desserts.